Charlie Reid says the makers of a new big-screen movie based around some of The Proclaimers’ biggest hits had taken their lives into their own hands by filming in Leith in November. The 50-year-old, one half of the hugely successful music duo, joined his twin brother, Craig, in visiting the set yesterday of the feature film Sunshine on Leith. Scenes from the movie, directed by English actor Dexter Fletcher, 46, are being filmed around Leith’s Shore area this week before shooting returns to Glasgow. Charlie said the crew had been blessed with the type of sunshine so rare in Edinburgh at this time of year. He said: “I’m just really glad for them that they have had decent sunny weather to work with. The film, starring Peter Mullan and Jane Horrocks, has been touted as a Leith version of Mamma Mia. The tale of two Scots soldiers returning to Edinburgh after serving in Afghanistan will heavily feature The Proclaimers’ hits, including I’m Gonna Be (500 Miles) and I’m On My Way. Charlie revealed the brothers had filmed a scene-stealing appearance during the visit to the neighbourhood where they were born. 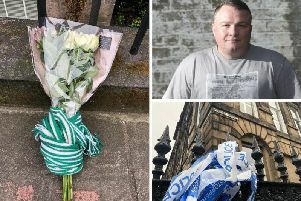 He said: “The lads who are playing two of the leading roles of the soldiers were walking along the street having come out of the Port o’ Leith pub. I think we were emerging from the door of Nobles pub two doors down. The twins received a sneak peek of several scenes. Charlie said: “We saw the [one] where they were skipping down the street singing I’m On My Way. Outside of providing the songs, the duo are having very little creative input in the movie produced by Andrew Macdonald, best known for Edinburgh-shot classics Shallow Grave and Trainspotting. Charlie said: “We agreed to one or two very minor lyrical changes on a couple of the songs and that’s it. I want to stay away from it apart from that. Most of the six-week shoot is taking place in Glasgow to keep costs down. Charlie said it was a far better outcome than original discussions. “A couple of years ago there was talk of doing the whole thing in Dublin because of tax breaks,” he said. “That would have been fine, but I’m really happy that he’s done all of it in Scotland, and between Edinburgh and Glasgow they’re doing the whole thing.